Warm, crumbly muffins right out of the oven? Is there anything better? My mom has been making these Cinnamon Sugar Muffins for years, and now I make them for my kids, and they have been and continue to be a family favorite! These are super moist, thanks to the secret ingredient…sour cream! The bits of cinnamon sugar add a delightful crunch throughout the whole muffin. They are perfect for breakfast or brunch, or anytime at all. I also like to make them for an after school snack, and they never last very long. I love that they take just a few minutes to whip up, and in about 30 minutes, you can have them ready to serve! This recipe also works well when you substitute gluten-free baking flour for the regular flour–my daughter needs to eat gluten-free, and I do this most of the time. This also works as a wonderful basic quick & easy muffin recipe—sub out the cinnamon sugar for blueberries, chocolate chips, or your other favorite mix-in. Chocolate chip muffins are another of my kids’ favorites! Grease and flour muffin tins. Mix flour, baking powder, baking soda, and salt; set aside. Pour the 1 c. sugar into a large bowl, then add the melted butter. Add eggs, vanilla, and sour cream, and mix well. Combine the 1/2 c. sugar and 2 tsp. cinnamon and set aside. Place a small amount of batter in tin, add desired amount of the cinnamon & sugar mixture (we like a lot ☺, probably a 1 tsp. or so), then add another small amount of the batter on top. Sprinkle lightly with the cinnamon mixture. Bake at 350° for 15 minutes, or until done. You really can’t go wrong with these yummy muffins. They’ve been a hit with everyone I’ve served them to. 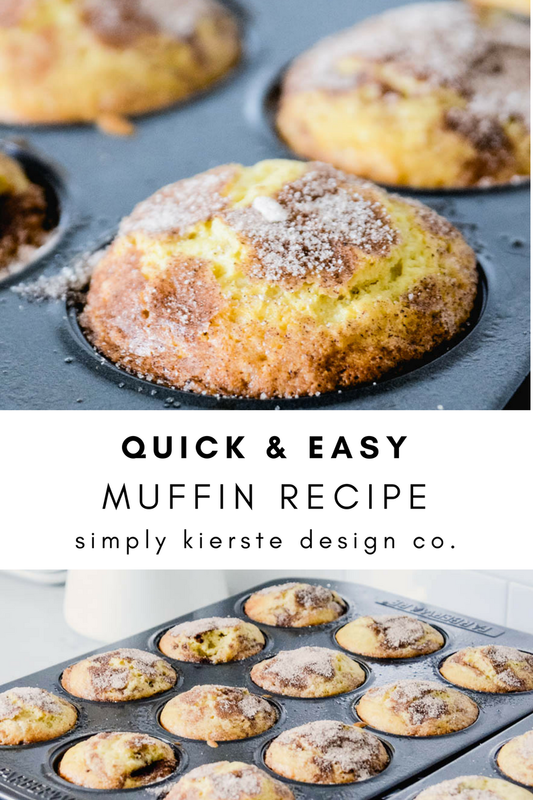 If you have overnight guests, dazzle them with these muffins right out of the oven! I’ve also taken them to my kids’ sports games–they’re great for an energy booster and snack in between games or on the road. No matter how you serve them, they’re simply delicious! Easy No-Bake Granola Bars…Just 3 Ingredients! RECIPE ARCHIVES…TONS OF GREAT RECIPES! Delicious!! My hubby would really love these. He’s addicted to anything with cinnamon in it. Thanks for the yummy recipe!! Okay, you’ll have to let me know what he thinks..they really are SO delicious!!! You are so welcome!!! So tell me, what do you use for the eggs and milk substitutions? Sorry this took me sooooo long to get back to you! My littlest guy was super sick with Strep. I am new to the Gluten free, egg free, dairy free diet and having to relearn cooking this way. My boys are both ok with almonds so we use Almond milk, we also use rice milk, coconut and soy milk (less often as it’s not the greatest for boys). Egg supplements are proving to be more difficult. I just made a GF, dairy free, egg free chocolate zucchini loaf that turned out yummy with supplementing the 2 eggs with two ripe mashed potatoes. I have also used applesauce in my pancakes with success and you can also buy an egg substitute and use that as well. I still have to try your fabulous muffins. I love following your blog and all your amazing ideas! My toddler and I made these today and they are THE YUMMIEST muffins I have ever had in my entire life. They will quite possibly be my undoing! Thanks for sharing. I just made these this morning for the first time. We had a big sleepover with neighborhood friends since we’re “snowed in” for the next couple of days in Woodstock, GA. Everyone loved these – including the hubs and I. FYI – – They needed a total of 20 minutes in the oven for me. Just made them. They were very yummy. I ended up with a lot of extra cinnamon/sugar combo. When I make these again (and I will), I will probably substitute wheat flour for 1/2 of the flour. Thanks for the recipe.